Editor's note: One of the most common, yet also most challenging, behavior problems that dog trainers are asked to address is reactivity. Those who live with reactive dogs often feel discouraged and hopeless, and traditional training methods often exacerbate the problem. Perhaps no one knows this frustration better than Emma Parsons, Karen Pryor Academy (KPA) faculty member and award-winning author of the bestselling book Click to Calm: Healing the Aggressive Dog. Based on years of experience helping countless clients and their reactive dogs, as well as on her own experience with her golden retriever, Ben, Emma developed innovative and effective strategies to calm and alter aggressive behavior. Emma's approach, explained fully in Click to Calm, has allowed her to help many individual owner/pet teams with reactivity issues. 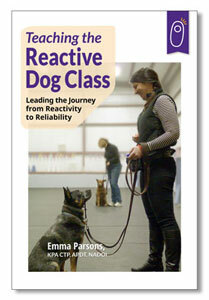 With her new, highly-anticipated book Teaching the Reactive Dog Class: Leading the Journey from Reactivity to Reliability, Emma expands her strategies and shares a better way to help even more owners and their dogs—by offering training in a group-learning environment. Presenting Emma Parsons' six-to-seven-week curriculum, Teaching the Reactive Dog Class is designed as a blueprint for instructors and go-it-alone owners of reactive dogs. In the following excerpt, Emma explains what inspired her to write this groundbreaking new book, and offers insight as to what trainers and owners of reactive dogs can expect to learn from it. I have been both an owner and a trainer of reactive dogs. 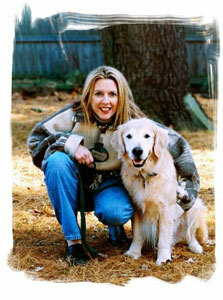 Many of you may know me from reading Click to Calm, a book written in tribute to my dog, Ben. For those of you unfamiliar with his story, Ben was a dog so reactive to other dogs that over-threshold encounters with triggers resulted in his barking, lunging, and even vomiting from the stress. Life with Ben taught me many lessons and made me a better trainer. Life with Ben taught me many lessons and made me a better trainer. While I knew he changed my own life in ways both profound and unexpected, little did I know that Ben's story and the training techniques that helped us live together more joyfully would inspire so many others, professionals and pet owners alike, to follow suit in pursuing positive training techniques to solve similar behavior problems. If you are currently working with reactive dogs or would like to move your career in that direction, it is likely that you, too, have known and loved a dog like Ben. If that is true, you know that living with a reactive dog can be tough, especially if you lack the knowledge or skills needed to help your dog feel better about the world around him. Owners of reactive dogs may feel frazzled, frustrated, discouraged, or hopeless. Worst of all, it can be a lonely feeling. It can feel, sometimes, as if you are navigating a world of friendly dogs and people who just can't understand what you and your dog are going through. You may have found yourself craving a support group, one where everyone understands what you mean when you say, "You know, he's really a wonderful dog, except when…"
You are his last shot. Many trainers who include behavior modification for reactivity and aggression in their offered services have experienced the same feelings of being isolated and misunderstood. It is easy to have great passion and enthusiasm for helping your clients through similar situations, but it can also be demanding. These clients may well be feeling hopeless and at the end of their rope. In many cases, a client will tell you about her dog, "You are his last shot." These clients require a lot of support and encouragement and, in fact, may need more training than the dog you are being hired to help. Traditionally, clients seeking assistance for reactivity and aggression are seen in a series of private lessons. Trainers working with such clients face myriad challenges: "Will we find an overly friendly and poorly trained off -leash dog at the normally quiet park?" "Will my assistant and my client be available at the same time for next week's lesson so I have someone on hand to work with a 'trigger' dog?" "This case will require multiple sessions to see a successful resolution. Can my client commit the time and money required to purchase an appropriate package of private sessions?" It is certainly possible to guide your clients successfully in rehabilitating their dogs through private lessons, but is it the best, only, or most efficient way to help them? Could I help more dogs if I could get these dogs safely into a group-class environment? After honing my skills in treating canine reactivity and aggression with Ben, I felt a strong desire to help others similarly. I traveled significant distances to help pet owners with dogs like Ben. These road trips provided me with a lot of time to think, and one of the thoughts that continually popped into my head was, "Could I help more dogs if I could get these dogs safely into a group-class environment?" If possible, such a class really seemed as if it would be a win-win-win for each cog in the training wheel: trainer, owner, dog. A trainer who was able to conduct a group class successfully would decrease the time investment per client, increase the number of dog/handler teams she could help, and, potentially, grow her business exponentially, since there certainly is a great need for such a service. Clients would find training more affordable than a similar number of private sessions. They would also benefit both from being part of a "support group" of other handlers who were working through similar problems with their own dogs and from the opportunity to practice multiple exposures in a heavily controlled environment where they would feel safe and not embarrassed. And the dogs? Nothing could be better for them than to learn the skills needed to successfully navigate an environment replete with former triggers. There were many logistic issues to consider, obviously. Was such a class even possible? If one dog/handler team dealing with reactivity issues was a challenge, how would dealing with many such teams in a single room be easier or more effective? One of the sacred cows of training reactive dogs is to be sure to keep them "under threshold" to prevent rehearsal of the unwanted behavior. Would placing numerous such dogs all in the same room together exacerbate the very problems we were trying to address? These were the questions that ran through my head when I started to wonder whether the techniques from Click to Calm could be modified successfully to work in a group-learning environment. Fran Masters, owner of MasterPeace Dog Training in Franklin, Massachusetts, was curious as well and willing to allow me to experiment with such a class at her facility. We needed a minimum of six dog/handler teams to make this venture financially viable for both of us. There was a caveat, however: there would be no screening of the dogs prior to class, no private lessons building foundation behaviors in the dogs and handlers, no detailed history-taking, no accoutrements that generally are associated with the process of initiating a training relationship in such cases. I was able to envision what I hoped would be an optimal learning environment. I thought about Ben. What kind of class would he have benefited from? Ben and I would have wanted an environment that was well controlled, where I felt as if I had the skills and tools needed to manage him successfully and keep him under threshold. Ideally, I would have loved to take a class where I felt as if I had a "helper" who was committed to guiding and protecting us through the learning process. Visual barriers would be helpful, as would someone who could coach me about when and how to move past their use. Having trained numerous reactive dogs and the people who loved them, I was able to envision what I hoped would be an optimal learning environment. I created a class built around these thoughts and the training techniques from Click to Calm. This was no small task and carried substantial risk: at best, the teams would see great improvement together. At worst, the behavior problems we were trying to solve would deteriorate, endangering the lives of the very dogs I hoped to help. With a dedicated group of assistants and a new class full of dog/handler teams, we jumped off a cliff…and we flew! The class lasted for seven weeks. All students attended an introductory class without their dogs where they learned to use a clicker by practicing mechanical skills with clicker-savvy, nonreactive dogs donated for the night by my assistants. This orientation allowed the students to learn in a stress-free environment and created an atmosphere of teamwork, fun, and collaborative learning that helped them feel much more comfortable the second week—their first night of class with their own dogs. Trying to round up the students at the end of the first night of class was a challenge; they were having so much fun that none of them wanted to leave! The second week was our "dress rehearsal." Students entered the classroom, one at a time, with their dogs. This session's primary focus was information gathering. "Does the equipment you are using feel comfortable for you?" "Will your dog readily eat the treats you have prepared and brought for class?" It was a chance for students and their dogs to familiarize themselves with the learning environment and to begin to feel comfortable in this new place together. The dress rehearsal also provided a chance for me to see each dog in the absence of the triggers he would encounter in class, establishing a baseline and basic familiarity with the dog and how he related both to his handler and to this new environment. This was the first true test—could these dogs learn in the same room together? The third week, we carefully brought each of the teams in individually, readying them to work at stations enclosed by visual barriers. This was the first true test—could these dogs learn in the same room together without visual access, or would the sound and scents of other dogs in the learning environment be enough to put them over threshold? To my delight, I found six dogs working happily with their handlers. Each consecutive week, the dogs practiced coming out from behind their barriers to work for greater periods of time. They handled gradually increasing exposure levels—first to one other dog, then more, first one second, then a few, outside of the barriers. I was proud of the handlers when I observed each dog practicing foundation behaviors successfully in the center of the classroom while the other dogs watched without overreacting. After seven weeks, I was thrilled to find that the class was successful beyond my hopes or expectations. Students and dogs progressed even more quickly than those I had seen for so long in private lessons. The students were pleased, the dogs were less stressed, and Fran and I celebrated what seemed to be a very promising new path toward helping our clients and business grow. I asked myself, "Were these dogs aggressive enough or was the class actually that successful?" After seven weeks, these "reactive" dogs looked suspiciously like dog/handler teams without behavior issues graduating a seven-week foundation-level manners class. To look at them, you'd hardly know the dogs had been reactive. Maybe it was a fluke. The only way to know for sure was to teach another set of students the same curriculum and see what those dogs looked like by Week Seven. Something about this class worked, and worked well beyond my greatest expectations. Yet again, my students astounded me with their progress. Something about this class worked, and worked well beyond my greatest expectations. Apparently, my students felt the same way, since the demand for additional reactive dog classes quickly surpassed my original estimate that one class every six months would meet the needs of the pet owners in my community. What we found instead was that for nearly every class we filled, we had a full waiting list for the next "semester." I found that I was able to cut the course down to six weeks and still achieve the same success with my students. This class worked well from the start. It works even better now that I have had years of experience teaching it and have helped hundreds of teams develop better relationships and more fully enjoy their lives together through this curriculum. What I hope this book provides for you is a curriculum that you can adjust to meet the needs of your clients and business. As with any course curriculum, it is a living, breathing thing that is meant to grow and adapt as needed; it evolves. I have learned as I teach this class that you can always swap out specific exercises or modify the environment to meet the needs of your learners. This class is never the exact same class twice. What the curriculum offers, however, is a sound guideline—for instructors as well as for owners of reactive dogs who want to help their dogs but don't have access to a class. It's a good set of principles, and it works. It is the most successful solution I have found thus far. This book is meant to help the instructor who is considering teaching reactive dog classes and those who are mulling over assisting in a reactive dog class, as well as owners of reactive dogs who would prefer to work on their own before venturing into a class. For instructors, keep in mind that every student is an individual, as is each dog you meet. Plan on changing the plan. Flexibility and the ability to think on your feet, skills you develop when seeing these clients individually, will continue to serve you well when serving them in a group learning environment. After reading this book, you may decide that work with reactive dogs is not for you. The profession of dog training is increasingly specialized, with niches developing for various dog sports, for the field of pet dog training, and for dog behavior problems, with some trainers even specializing in a single behavior challenge like separation anxiety or reactivity. Each trainer has an individual path to walk, and your path may take you away from working with reactive dogs and toward specializing in puppies, blind and deaf dogs, search and rescue dogs, therapy dogs, or toward building the next world champion for agility or Schutzhund. But if you choose to involve rehabilitating reactivity and aggression in your career, it is my hope that this book will provide a guide that gives you support, new ideas, and the skills you need to thrive on that journey. Remember to "split, not lump," and set yourself up for success as you would your students—develop your teaching skills at a pace dictated by your comfort, skill level, and the progress of your students. Any of the exercises presented in this book will work well if you want to start teaching "semi-private lessons" of two or three student teams before you launch into teaching a class, so always work under threshold! You can add teams as your comfort level with the material increases. My hope is that this curriculum improves your business as much as it has the lives of the dogs and clients who have benefited from it over the years. Imagine being able to tell your clients, "I can prescribe a treatment that almost certainly will improve your dog's behavior with no unwanted side effects." How great would that feel? Lucky for you, that remedy is in your hands right now. Nearly every client who has walked through the doors at MasterPeace has achieved the results they wanted from the class—a dog that is reliably trained and able to relax in the presence of triggers that previously elicited reactive or aggressive responses. The dogs that once were "projects" have been successful in their transition to pets. Many have gone on to compete in performance venues, but they have all become more enjoyable companions for the humans who love them. My hope is that this curriculum improves your business as much as it has the lives of the dogs and clients who have benefited from it over the years, and that on Week Six of your first reactive dog class, you will drive home from the classroom feeling as proud as your students will. If you're working on your own to help your dog overcome his issues, I hope this book will give you the guidance and support to do so safely and effectively so that you and your dog will find new joy in your life together. To learn more about Teaching the Reactive Dog Class, or to purchase, visit http://www.clickertraining.com/teaching-the-reactive-dog-class.